The Paranormal Affairs Division of the Bolingbrook Police Department has received over 100 complaints related to the upcoming election. While the division officially does not exist, let alone release details about their investigations, The Babbler uncovered two of the complaints. The second complaint claims that Trustee Rick Morales has an army of monsters that are stealing his opponent’s campaign signs. Two eyewitnesses first claimed they had recordings of him issuing orders to the monsters. When the investigator mentioned that it is illegal to record a human without their consent, the eyewitnesses suddenly remembered that they called 911 while Morales issued the orders. The dispatcher, said the eyewitnesses, should have recorded Morales issuing the orders, not them. Officer Steve explained, “It was a Minnesota Talking Land Squid. 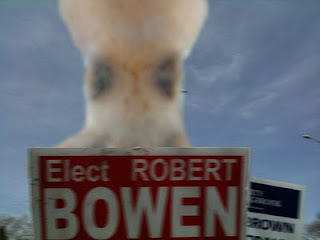 They’ve been stealing campaign signs, mostly those not belonging to the First Party of Bolingbrook.” Steve explained that either the squids are attracted to the paper used in the signs, or the candidates offended PZ Myers. Officer Steve says this case has been turned over the FBI, but expects it to be resolved soon. Officer Carl is suspicious about the complaints. Officer Bob says the department will do their best, adding that although they haven’t experienced any budget cuts, it will take some time to resolve. Claar added his own horserace assessment Bolingbrook Trustee election. When reached for comment, Ken Cygan bored this reporter with his political platform. The other candidates could not be reached for comment.